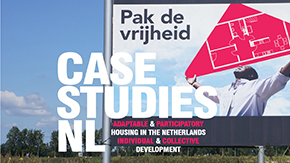 The documentary `CASE STUDIES NL` is a research project that portrays a kaleidoscope of seven Dutch housing developments which all have adaptability and participation of the inhabitants as their core concepts. The key players of each project discuss the failures and successes of the various designs and their underlying processes. Although set in very different contexts and scales, mutual issues arise. Understanding these may help future initiatives and developments to succeed.